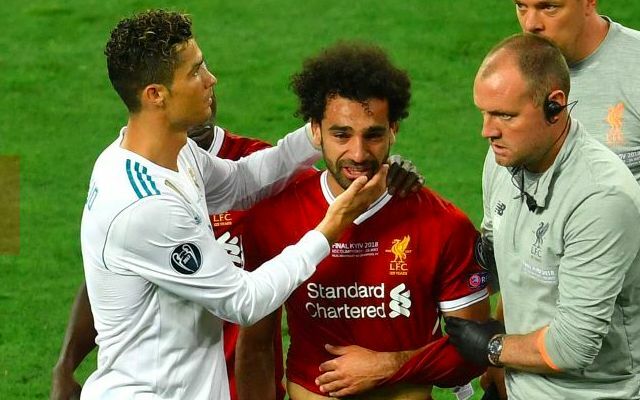 Fingers are crossed in Egypt over the fitness of Mohamed Salah after his headline exit from Saturday’s Champions League final in Kiev. The Liverpool forward’s night was cut devastatingly short as he was forced off in the first-half after landing heavily on his shoulder during a challenge with Real Madrid’s Sergio Ramos. Salah left the field in tears and headed straight for the tunnel for further examination amid initial fears his World Cup hopes could be in jeopardy. A unforgettable season for the summer signing threatens to end in heartbreak with the finals in Russia just under three weeks away. That said, the Egyptian national team appeared to have a more optimistic take on the extent of the matter by talking up Salah’s chances of appearing at the World Cup. Salah’s premature departure proved a crushing hindrance to Liverpool’s bright start and seemingly paved the way for Real Madrid to iron over an erratic opening. Liverpool had rattled the reigning champions in the early stages with their notoriously fierce pressing from the front to restrict Madrid’s usually gallivanting full-backs and the service to Cristiano Ronaldo and Karim Benzema. Two second-half mistakes from Loris Karius and a stunning goal from Gareth Bale saw Liverpool’s monumental effort in Salah’s absence cruelly come to no avail. The clock is now ticking on Salah’s mission to get himself fit for a World Cup he booked Egypt’s place at with an injury-time winner from the penalty spot against Congo.